Cottage Gardens are Charming and Overflow with Flowers! Cottage Gardens are romantic,colorful,cozy and charming landscape designs! They are places you want to wander through and smell the flowers, relax in and read a book, or spend time with a friend. It grabs your attention and soothes your soul. What a place! 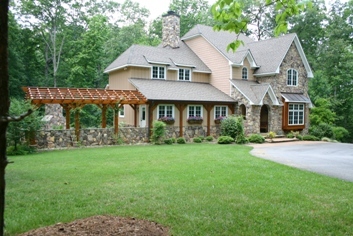 Isn't this a wonderful cottage-style house? The view when you drive up to this house is casual, warm and welcoming because of the structures that enclose and accent the garden. The pergola has newly planted Lady Banksia roses on it that will have cascades of small yellow roses on them in the spring. The pergola is a wonderful design and color, perfectly accenting the house. You would never know it is an addition. 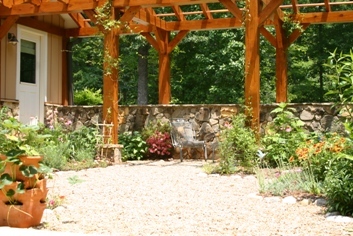 The architect, Dan Ensminger, made the cottage garden structures look like a natural extension of the house. The window boxes add another charming touch. 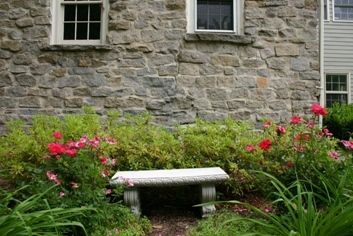 Roses, stone walls, arbors and lots of color are main elements of this style garden. Cottage gardens are often called English gardens. The climate in England is perfect for gardening. The cool temperatures, adequate rainfall and constant low sun light are great growing conditions for many plants. The mid-Atlantic region of the United States, where I live and work, has just the opposite conditions in the growing season. We have hot long days, low rainfall and bright sun. A gravel path leads through the garden of lush plants! The look shown in this photograph is definitely possible in all regions of the country. However, you must keep in mind your climate and growing conditions when selecting plants. Cottage gardens are close to the house or surround it giving it a cozy, relaxed feeling. This aspect makes it differ from other flower gardens like cutting gardens or sweeps of flowering plants interspersed with shrubs and trees that are in the middle of a lawn. This garden is nestled between a beautiful gray stone house (notice the corner of it in the photo) and a gorgeous stained wood fence topped with hand-made horizontal lattice. These structures are complimented by the assortment of plants that give color and texture to the landscape. Isn't this a wonderful welcome to a back yard? In the foreground of this picture on the left is a Crimson Queen Japanese Maple. It stays small, has burgundy leaves and a weeping growth habit. The pink flower under it is the perennial, ice plant. It has succulent foliage and is long blooming. Edging this bed is dwarf garden juniper. Its foliage is bright green which contrasts well with the maple. The turquoise container with the red flowering hibiscus adds a nice accent. Evergreen shrubs are a part of this cottage garden to keep the garden interesting all year. Many of the shrubs are spring blooming which gives the garden a different look from this summer garden. This simple concrete bench next to the house provides a great spot for a visitor to rest and take in the landscape design. It also connects the garden to the house. The Knock Out Roses on either side bloom all season. They are a low maintenance rose variety for rose lovers. The shrubs behind the bench are azaleas and are full of colorful flowers in April. Landscape Design Question? I've got an answer! Submit a question, get a quick response and see your question become a web page on this site. All the readers can see it and you can share it with your friends. Installing the landscape design is just the beginning! Your investment should grow bigger and stronger each year. Subscribe to the quarterly newsletter, Landscape Update! Get seasonal recommendations for the best care of your plantings. Landscape Update will highlight products that are used in the landscape. Landscape projects may be discussed to help illustrate a product or landscaping ideas. Situations I encounter that will help you with your landscaping, I’ll pass on to you. Using pictures to illustrate a point is a favorite of mine. You will find a wealth of information to help you better take care of your landscape, help you add an exciting new element to it or learn about what’s new! 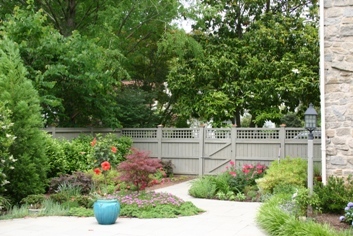 Related Pages: Perennials; Patios; Fences; Back Yards; Small yards and Garden Walls. SBI (Site Build It) is a powerful website creation and hosting system that shows you how it is done step by step. Take a look!